Hidden deep in the forests of southern India, this renovated bungalow provides an ideal quiet space for those looking to escape the city and enjoy nature. Called Hornbill House, the building is part of a 135-acre estate that will soon offer 8 additional bungalows that can be rented out as farm stays. The 9 structures designed by Biome Environmental Solutions are scattered across a tea and coffee plantation on an "end of road property." The designers were commissioned to renovate an existing bungalow and design an additional 8 structures which would function as retreats. The owners, looking to rent out the small buildings as farm stays, wanted to provide privacy to the guests but facilitate good infrastructure within the estate. Dirt roads and footpaths winding through the property are used to reach different locations with ease. The house sits near a waterfall and provides excellent views of the landscape-the valley and the backdrop of mountains. All rooms boast great views of at least portions of the landscape and feature composite stone and mud brick walls. While the exterior stone walls blend with the adjacent rock face, the interior mud walls give warmth to the house. In contrast to the lower portions of the structure, the sloping roof looks like it’s about to fly into the mountains. The designers were commissioned to renovate an existing bungalow and design an additional 8 structures which would function as retreats. The owners, looking to rent out the small buildings as farm stays, wanted to provide privacy to the guests while facilitating infrastructure within the estate. Dirt roads and footpaths wind through the property and are used to reach different locations with ease. The house sits near a waterfall and provides excellent views of the landscape-the valley and the backdrop of mountains. All rooms boast great views of at least portions of the landscape and feature composite stone and mud brick walls. 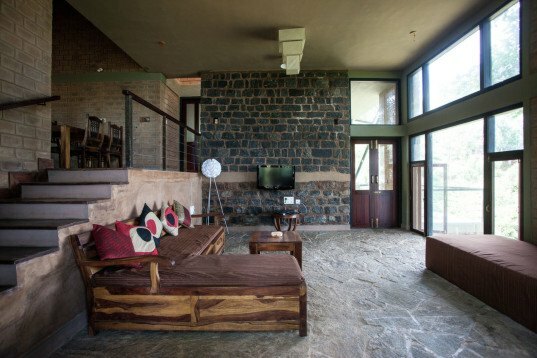 While the exterior stone walls blend with the adjacent rock face, the interior mud walls give warmth to the house. 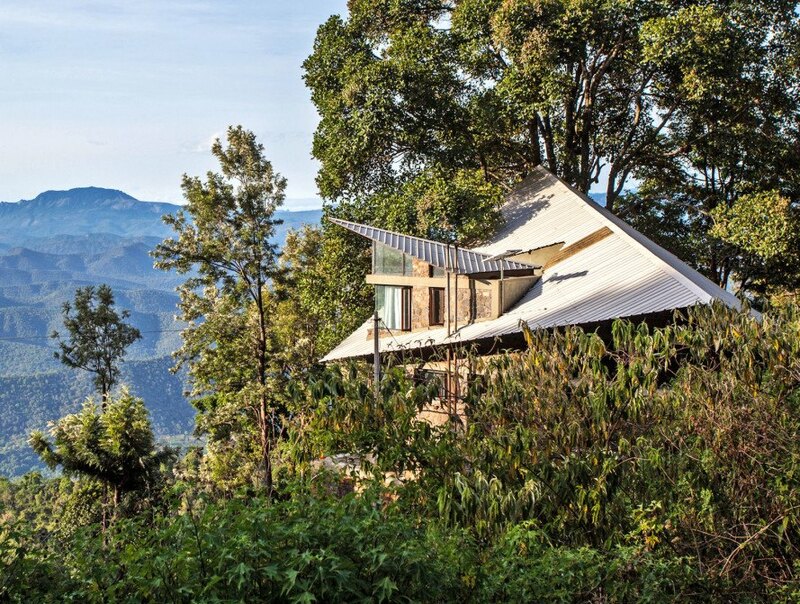 In contrast to the lower portions of the structure, the sloping roof looks like it's about to fly into the mountains.